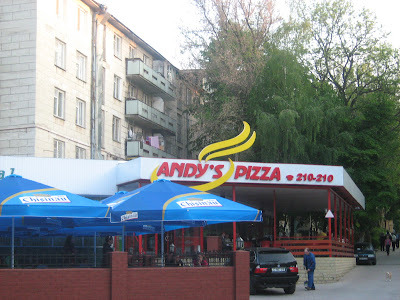 Barb In Moldova: Virtual Tour of my New Apartment! Virtual Tour of my New Apartment! Welcome to my new home! 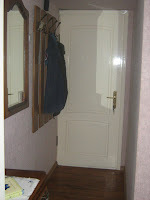 Come through the narrow entrance hall - but hang your jacket on the hook there, and leave your shoes by the door, as is the custom in Moldova. I bought fresh flowers at the market across the street today, and here is my guest book. Please be sure to sign it before you leave! My friends just went home from my house-warming party so I haven't tidied up the living room, yet. 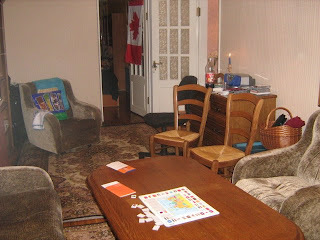 After you and I have had a visit I will put the extra chairs back in the kitchen, blow out the candle and put the puzzle away. This evening our Brazilian family were here with their two children and they enjoyed working on this puzzle. When the British family return with their five children, I'll have to find more forms of entertainment than that! Come on in and see my lovely little kitchen. Everything is clean and well-built and I love sitting at my little table looking out at the leaves and the birds as I eat my meals. I am getting organized - was really glad to find my electric kettle so that I can prepare tea more easily. I was really surprised about this great stove/oven. 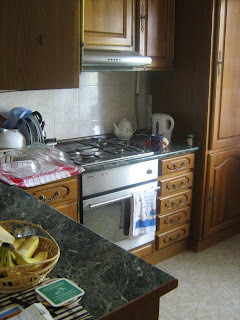 It is gas AND electric, whereas most stoves are just gas for the burners and for the oven. And it has an automatic flint so I don't have to use matches to light the gas burners! Small things but they do make a difference. I won't include a photo of the bathroom - it's just tiny, with a shower, sink and toilet. But most important, there is a washing machine. And I can hang out my clothes on the lines on the balcony. So here's my bedroom/office. The apartment is basically a big rectangle, with the bedroom on one end and the living room on the other. 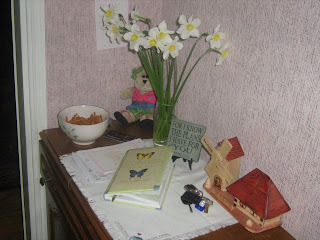 As you can see, there is a wonderful desk and cupboards for me to work at. There is storage space for everything! 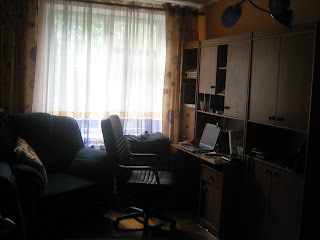 And there is a cozy chair that I can curl up in to read in the morning on days off or to watch movies on my computer in the evening. Shelves for books and a bed that I have made comfy with my single mattress and magic foamie (it's a double bed, but oh well). As you can see, once again the Lord has blessed me far beyond my hopes and expectations. So here's the photo of the outside of my building. My balcony is on the right, second from the top. You can see how perfect this location is, especially for those evenings when I am too tired to cook supper. Hope you enjoyed your tour! 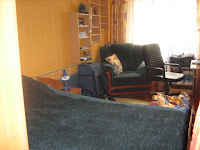 If you ever come to Moldova, I would love to give you the tour of my apartment and lots more in person. Now, if you were here, I would ask you to sign my guest book. Since you're not, please sign my virtual guestbook by leaving a comment! Thanks! Posted by Barb at 12:29 p.m. 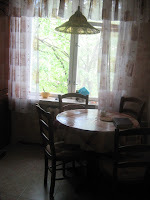 I think the practice of removing shoes in homes is excellent and I am very glad they do that in Moldova. I wish more people in the UK would adopt this custom.